Want to know how to make a rhubarb and custard cake? 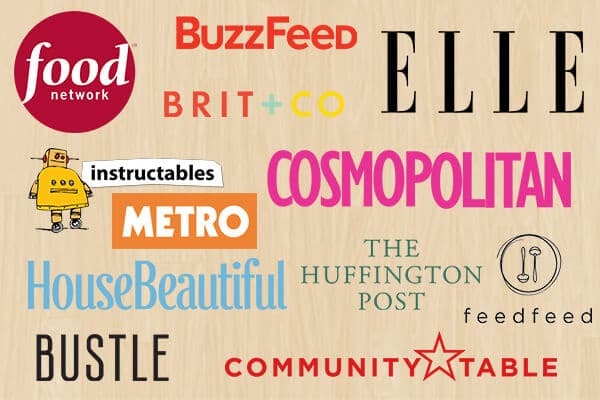 So did I. That’s why I fashioned together this helpful post just for you! I’ve always absolutely loved the whole rhubarb and custard combo. 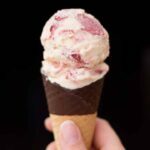 If you do too you should totally check out my rhubarb and custard ice cream recipe too! So I figured, why not turn it into a cake? 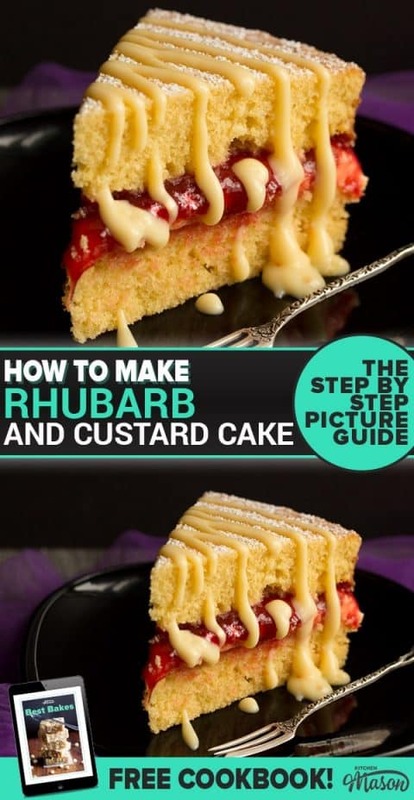 In this post you’ll learn how to make your very own rhubarb and custard cake using my simple step by step pictures and top tips to help you every step of the way. I’ve come to realise that rhubarb and custard is a bit of a Marmite flavour combo. Me? I think it’s incredible! Others, not so much. I will say this though – turning such a classic combination into a cake was really fun for me! It presented a challenge working out the best way to incorporate both flavours so you could really taste them but I think I’ve cracked it. 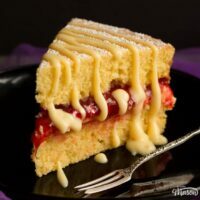 With a custard flavour sponge and icing sandwiched together beautifully with a delightful rhubarb jam, you can’t really ask for much more in life can you?! 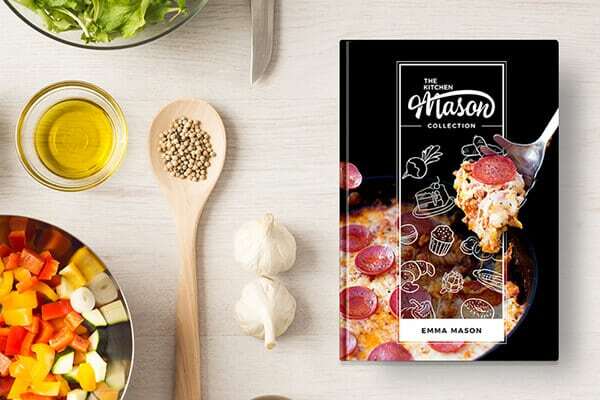 The flavours work so well together it’s like Bonnie and Clyde or Romeo and Juliette – they were just meant to be together! If you use this rhubarb and custard cake recipe, I guarantee you will be back to make seconds. It’s CRAZY delicious and too moreish for it’s own good! I say this a lot but don’t forget to read through the whole recipe before starting. 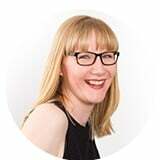 There’s nothing worse than getting to a critical stage and realising you’ve forgotten something! It could end up being less of a rhubarb and custard cake and more of a rhubarb and custard mess. Love custard but not a huge rhubarb fan? 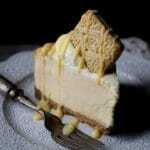 Use a different flavour jam or try my custard cream baked cheesecake instead – it’s heavenly! 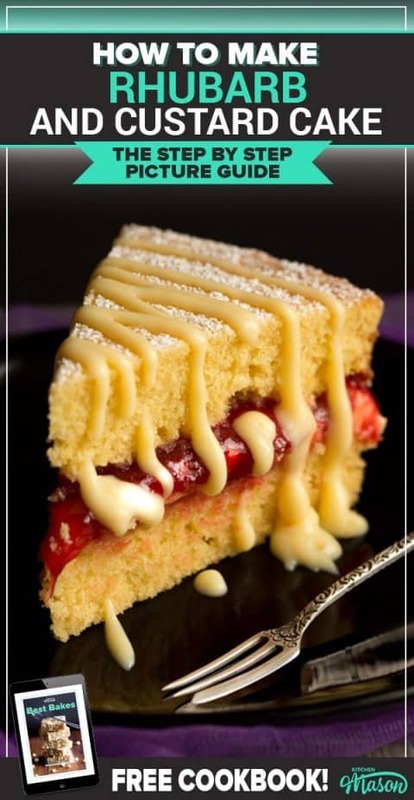 You can always go for the all time classic victoria sandwich cake too, you can never go wrong with that one! Make sure all your fridge ingredients are at room temperature before you start. Not only will it make life easier for you but batters work much better when everything is the same temperature. Don’t open the oven until the last 5 minutes of baking. And only do this to check if it’s done or not – otherwise your cake may collapse. Allow the sponge to cool completely before attempting to decorate or your filling will melt everywhere! Not ideal. 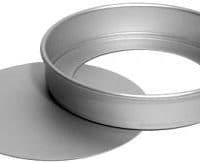 Bake cakes in the lower part of your oven to help prevent domes from forming in the middle. Never store cake in the fridge. Fridges draw moisture from food so it will dry out your cake! Nobody wants dry cake. Be careful when adding liquid to the icing. That custard powder wants to become a liquid – this is not what you want in your icing! Here is what you will need to serve 10-12. Lightly grease and line your baking tins then preheat your oven to 180°C/Fan 170°C. Add all the cake ingredients into the bowl of an electric stand mixer (or a large bowl with an electric hand whisk). Then give it a good mix until all the ingredients are blended well, smooth and you can’t see any more flour. Don’t overdo it though! Mix only until everything is blended and smooth. Evenly divide the batter between the two prepared tins and smooth out. Place both onto the lower shelf in the oven and bake for 12-18 minutes until a skewer inserted into the middle comes out clean. When you can handle the tins – remove the cakes, peel off the baking paper from the bottoms and place them onto a wire rack to cool completely before decorating. Sift the icing sugar and custard powder into the bowl of an electric stand mixer (or a large bowl and use an electric hand whisk) then weigh in the butter. Having the butter at room temperature here will make your life MUCH easier! Beat on slow to begin with then, once the powdered ingredients have blended in, crank up the speed and give it a really good beat for at least 3 minutes. When it’s nice and smooth, add in 1 tbsp of milk. Be really careful not to overdo this – due to the added custard powder this frosting is liable to become more liquidy much easier than a regular frosting. Then give it a final beat for another minute or 2 until light and smooth. Take one sponge layer and place it on a cake stand or serving plate. Now you can do one of two things here. Ignore the whole making it look ‘pretty’ thing and just whack on all the icing then smooth it out with a spatula. Or, you can load the icing into a piping bag fitted with a large round nozzle (or just snip a larger piece than usual off the end) and pipe blobs around the edge of the sponge. Fill in the rest of the middle with a big spiral. It doesn’t matter about piping blobs in the middle as no one is going to see that part – even when you cut into it! Next, pop that rhubarb jam into a little bowl and give it a little mix to loosen it up a little. If you like you can add a little pink (or red) food colouring gel here to liven up the colour. It’s not really that pretty is it?! At least now you know I’m actually human haha. And that’s it! All that’s left to do is generously dust the top with icing sugar just before serving. Store your cake in an airtight container (preferably metal) at room temperature and consume within 3-4 days. My biggest tip for this recipe would be to go the extra mile and make your own rhubarb jam. There’s nothing quite like it and it adds so much to this recipe. Shop bought ones are ok but I’ve found them to be much sweeter and they actually seem to mask the earthy rhubarb flavour that we all know and love. This easiest rhubarb jam recipe from Chritina’s Cucina is really simple to make and absolutely beautiful! This rhubarb and custard cake will become a household favourite! It's really simple to make and tastes absolutely divine. Preheat your oven to 180°C/Fan 170°C and grease/line the base of your baking tins. Put all the cake ingredients in an electric stand mixer and beat until smooth. Divide between the two tins and bake in the lower part of your oven for 12-18 mins until a skewer or knife poked in the middle comes out clean. Remove from the tins, peel off the baking paper and cool completely on a wire rack. Put the icing sugar, custard powder and butter in an electric stand mixer and beat until light and smooth. If it's still too thick, add 1 tbsp of milk and beat again until smooth. If your cakes have domed - level them out with a sharp knife. 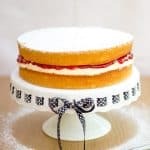 Either spread the custard buttercream straight over the top of one of the cake layers with a spatula or load a piping bag with a large round nozzle/snip a chunky piece off the corner. Then pipe blobs around the edge and swirl the rest in the middle. Spread the jam carefully over the top of the buttercream, almost right to the edge but not quite. Add the other cake layer bottom side up onto the top. Sieve icing sugar generously over the top and serve. Store in an airtight container at room temperature and consume within 3-4 days. O.M.G. I drooled from beginning to end on this post! 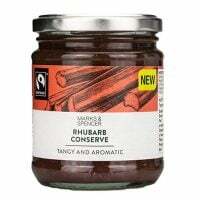 I cannot wait to try this myself as I have plenty of rhubarb jam! I love that you showed the jam spilling over, too! Yes, it happens to all of us! 🙂 Thanks for sharing, I love it!